By Shari Ireton, Snohomish County Sheriff's Office Director of Communications. 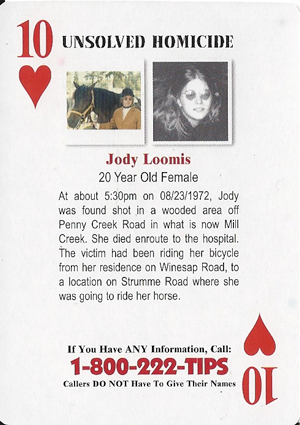 Detectives from the Snohomish County Sheriff’s Offices arrested a 77 year-old Edmonds (Washington) man on Wednesday, April 10, 2019, for the 1972 murder of 20 year-old Jody Loomis. Her body was found in what was at the time a heavily wooded area near what is now Mill Creek Road, east of the intersection of Bothell-Everett Hwy and 164th Street SE in Mill Creek. Terrence Miller, who was identified as a suspect through genetic genealogy, was arrested at his home on Wednesday at around 10:30 am without incident. He has been charged with 1st degree premeditated murder and is being held in the Snohomish County jail on $1 million bail. “After more than 46 years of searching for her killer, we finally have some answers for Jody’s family,” said Snohomish County Sheriff Ty Trenary. Successful identification of Miller was established with assistance from Parabon NanoLabs and genetic genealogist Deb Stone. A digital file containing DNA genotype data gathered from evidence collected from the victim was uploaded to GEDmatch, a public genetic genealogy website. Several promising matches were found for a few of the suspect’s relatives identified in his family tree. After the genealogist identified parents of possible suspects based on the family tree, police acquired an abandoned DNA sample from a cup one suspect had used. Washington State Patrol’s crime lab confirmed that it positively matched the DNA profile from the crime scene evidence. If you or anyone you know has information related to this case or suspect, please call the Snohomish County Sheriff’s Office tip line at 425-388-3845. Jody Loomis and her horse. Photo courtesy of Snohomish County Sheriff's Office.